LiveJournal is a Russian social media service that hosts user blogs, journals, and diaries. LiveJournal has around 15 million active users each month. 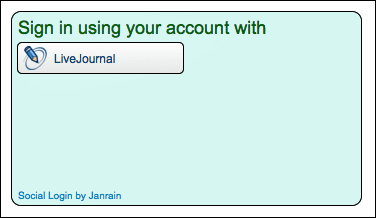 Use the Social Login Dashboard to configure LiveJournal as a social login provider. No additional configuration is required. From the list of Providers, click LiveJournal. LiveJournal appears in your social login widget. When you are finished, select Save and Publish and then click Publish. 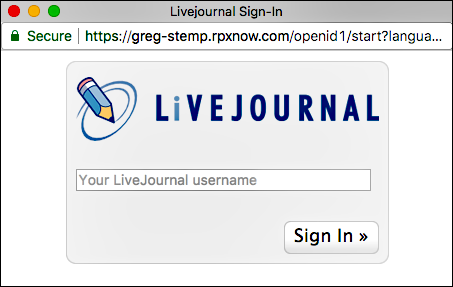 It might take as long as one hour before LiveJournal appears as a social login option on your web site. The returned profile information will vary depending on the LiveJournal account used in the test. From the Configure Providers page, click LiveJournal. In the widget, click the X in the upper right corner of the LiveJournal icon. Scroll to the bottom of the page, select Save and Publish, and then click Publish. LiveJournal no longer appears in the sign-on widget.